As Maryland’s newest strategy to avert school violence — an anonymous tip system — gets off the ground, other states have seen a surge in reports after school shootings and other incidents of mass violence. ANNAPOLIS, Md. — As Maryland’s newest strategy to avert school violence — an anonymous tip system — gets off the ground, other states have seen a surge in reports after school shootings and other incidents of mass violence. Safe2Tell Colorado, Safe2Tell Wyoming and Safe Schools Maryland are examples of these anonymous programs, which all feature a tip line, an app and a link to use on mobile and desktop browsers. The Safe Schools Maryland tip line and app were created as an effort to reduce the likelihood of school violence, according to Gov. Larry Hogan. 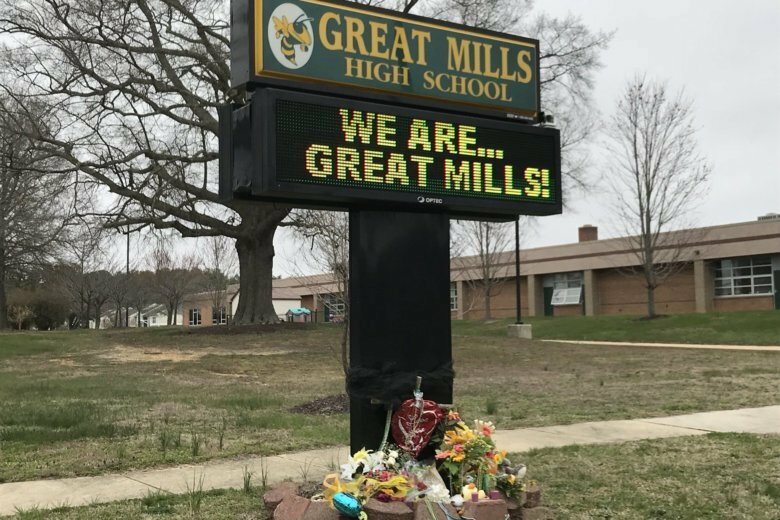 A shooting at Great Mills High School in March that left two students dead, including the gunman, forced the state of Maryland to speed up the process of getting the tip line and app working, according to Hogan. “This tip line and app can be the difference between students taking matters into their own hands,” said Donovan Weekley, a junior at Great Mills High School. Safe Schools Maryland originated after Hogan proposed and signed school safety legislation that was supported by both Democrats and Republicans during the 2018 legislative session and provided $40 million in funding in his fiscal year 2019 budget, according to Jorge Castillo, spokesman at the Maryland Emergency Management Agency. The Maryland tip line and app have been active since Oct. 3. The tip line number is 1-833-MD-B-SAFE (1-833-632-7233) and the app can be downloaded on the App Store and Google Play. There have been 133 total tips received statewide from the launch date of Oct. 3 through Nov. 30, according to Emily Allen Lucht, spokeswoman for the Maryland Center for School Safety. Of the 133 total tips, 69 were reported through website browsers, 36 through the app and 28 through the tip line. In October, the Special Investigations and Narcotics Section Major Offenders Unit of the Anne Arundel County Police Department received a complaint that was sent through the Safe Schools Maryland tip line regarding two suspects who were selling controlled dangerous substances in the Broadneck area. On Nov. 16, a search warrant was executed at a residence in Annapolis, where homemade edibles with THC — the chemical responsible for most of marijuana’s psychological effects — were seized, as well as other drug paraphernalia. Safe2Tell Colorado saw a 74 percent increase in the number of reports from the 2017-2018 school year compared to the 2016-2017 school year, according to the Safe2Tell Colorado website. The Parkland, Florida, shooting at Marjory Stoneman Douglas High School in February left 17 students and staff dead and 17 others injured; a former student has been charged with 34 counts of premeditated murder and attempted murder. The Safe2Tell Colorado tip line went live in 2004 as a result of the Columbine High School shootings in 1999 so students, school faculty, parents and community members could report information about issues or concerns relating to their safety or the safety of others, according to the Safe2Tell Colorado website. The app was introduced in 2015. There were 16,000 tips received by Safe2Tell Colorado in the 2017-2018 school year; 134 of the tips were considered to be misuse of the system, according to Skinner. Of those 16,000 tips, 31 percent of them were reported through the mobile app, according to a report on their website. After a 15-year-old girl and her friends were the target of false reports in Colorado earlier in 2018, state Legislator Jonathan Singer, D-Longmont, sponsored a bill that would help analyze data from the Safe2Tell Colorado program and help track how many false reports are made, so kids are not using it as a backdoor to bully others. Colorado’s tracking bill went into effect in August. “Part of the reason that we ran the bill was to ensure that these data points are actually being collected accurately,” said Singer. The bill allows all school districts to review the reports received by the Safe2Tell program. Safe2Tell Wyoming was created in 2016 as a response to mass school shootings around the country and a threat at a Wyoming high school, according to the Safe2Tell Wyoming website. There were 887 tips received by Safe2Tell Wyoming in the 2017-2018 school year and 50 percent of them were reported through the mobile app, according to a recently completed report. Safe2Tell Wyoming saw a 76 percent increase in the number of reports from the 2017-2018 school year compared to the 2016-2017 school year, according to the report. The Safe Schools Maryland, Safe2Tell Colorado and Safe2Tell Wyoming apps were all developed by Anderson Software. The analytics of the Safe Schools Maryland app are being tracked through a software platform called P3, which provides records of time, types of tip, location of the tip, actions taken and resolution of the tip. The most tips received by Safe Schools Maryland fell under the drug distribution/use/sale/abuse category, while bullying/cyberbullying and teasing had the second-most tips. As of Nov. 16, the Safe Schools Maryland app had 1,266 total downloads, 935 from Apple devices and 331 from Android devices, according to Dawn O’Croinin, counsel for the Maryland Center for School Safety. People who use the Safe Schools Maryland app can choose from 42 categories of incidents to report information and all 24 school systems in Maryland are participating. At least one other person had some type of knowledge of the attacker’s plan in 81 percent of planned or targeted violence in schools, according to a 2008 United States Department of Education study. Of those individuals, 93 percent were peers of the perpetrators — either friends, schoolmates or siblings.